21-CU-FT OF MERCHANDISING SPACE: Offer more point of sale options. 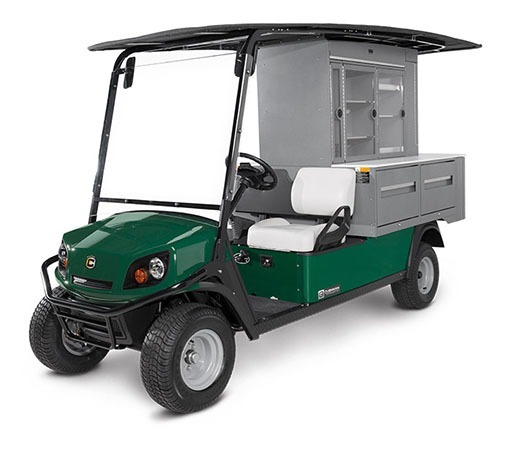 INNOVATIVE FLEXSERVE DESIGN: Add versatility for on-course sales and event needs. SLIDE-OUT PEG BOARDS: Drive impulse purchases with your golfers. VERSATILE ENDCAP: Switch between morning coffee and afternoon beverages. FULL-EXTENSION DRAWERS: Easy browsing and refilling. Left - 26 ft. 8 in. Right - 25 ft. 2 in.